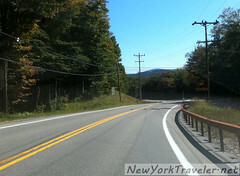 The drive on Route 28 from Utica to Blue Mountain is a cornucopia of sights, sounds and smells. We catch glimpses of azure lakes peeping between the Scotch pines and Douglas fir trees that stand at attention on each side of the road. I often have a difficult time staying in the lane, because the scenery is so spectacular and I am drawn to it like a duck to water. Much of the lakefront property is privately owned, so we cannot stop and explore the area. However, we were delighted to see a public beach in Blue Mountain Lake, NY, situated at the intersection of Routes 28 and 30. We pulled over to have our lunch and soak in the glorious scenery. I’ll allow the photos to tell their story, but realize the area is ten times more colorful and peaceful and enjoyable. Ah! The park is small, the smallest beach I’ve ever seen. There are a smattering of picnic tables and a bench. You can also sit on a rocky bank near the boat launching area. Swimming is allowed only when a lifeguard is on duty (no one was here today), but even if there was, I doubt anyone would venture into the lake’s very chilly waters this late in the year. I was so tempted to wade into the lovely waters, though! Several boaters paddled out from the launch toward the center of the lake, replete with long fishing poles and boxes full of bait. I have no idea the type of fish in this lake, but I could guess trout is popular in this area. My kitty enjoyed watching the minnows darting near the water’s edge, tantalizingly out of reach. 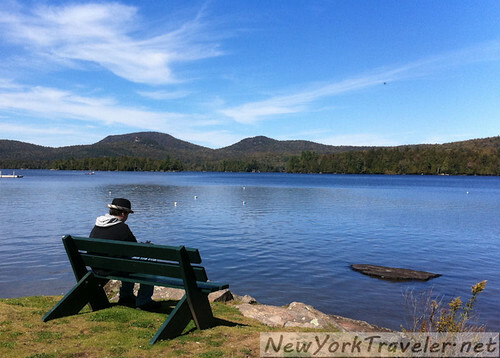 While the park is tiny, it was rather busy for sleepy little Blue Mountain Lake, NY. Several bikers, taking a break from their motorcycle trek through the Adirondacks, stopped for a respite. Other folks, obviously locals, launched boats and another group of visitors sauntered in with picnic baskets. Restrooms and water fountains are across the street, next to a radio tower that the boys found interesting. We stayed, riveted to the scenery, for about half an hour. If you are passing through on Route 28, take a moment to stop here and catch your breath. The air is crisp, the view is stunning. I am desperate to return! It is to pretty up there, I agree. I am heading up north this coming Saturday with my sister to check out the foliage. I hope to remember to bring my digital camera, I always seem to forget and have to resort to cell phone pics. 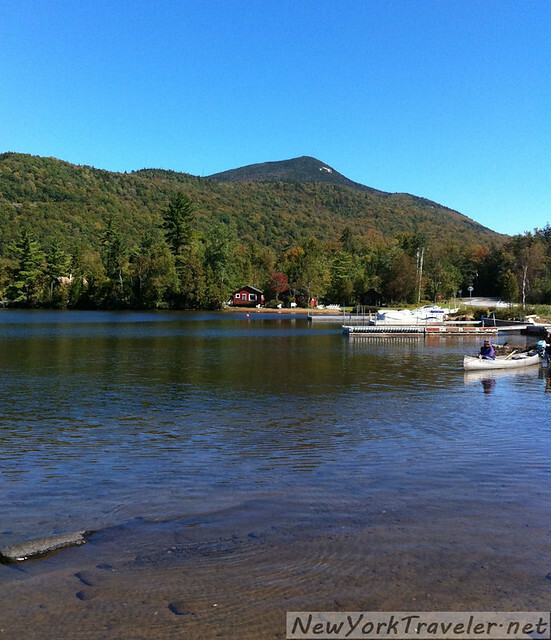 Moe and I got married in Lake Placid, have you ever been there? We can’t wait to go back, its so beautiful and calming. The whole ride up is amazing! Oh, you’re in my stomping grounds, m’dear, and bringing back lovely memories. My grandfather’s camp was 5 or 6 houses to the west of the beach. It had porches upstairs and downstairs that hung out over the lake. In those days, there was a small grocery store right in the center of town. Across the street was the post office and a lovely gift shop. I always brought home some of those little pine-scented cones to burn. FYI, a few years ago the state bought several of the islands in the lake, and opened them up for camping. Obviously, you need a boat to get there, but talk about privacy! My hubbie and I stayed once several years ago and it was wonderful. There’s also a nice public beach on one of those islands. Jean– Woooooooooooooooooooooow! What a wonderful place to have a camp! Thank you for this post! We will be camping with friends at Blue Mountain this weekend, and I was looking for a place to swim, or at least put my feet in the water 🙂 This looks like the perfect place. Also, your cat is gorgeous! What type is he or sher? Looks like there is some wildcat in the mix there!